Weird weather in London today. Not only is it cold and windy, but occasionally furious flakes of snow whirl by my office window. Then they stop. Minutes later, they reappear. Where do they go? Where do they come from? Anyhoos, on my walk with Miles today I remembered all of the beautiful flowers I used to see on my walk through the South End of Boston on my way to and from work. This was one of my favorite yards. I keep reminding myself that spring isn’t too far away. This entry was posted in Travel Photos and tagged 50 Year Project, Blog, Blogging, Boston, Flowers, Fond Memories, Life, Massachusetts, Nature, Photography, South End, Spring Flowers, Travel, Travel Blog, Travel Journal, Travel Photo. Bookmark the permalink. That bed of flowers would cheer one up! Those are simply beautiful!!! I am wishing for a bed of flowers like that right now!!!! Probably not my yard with my deer issue but there are gardens I can go visit…. Oh those pesky deer…so cute and so destructive. Tulips are such a sign of Spring, aren’t they? Weather here in Brisbane has been the same lately – sunny one minute, pouring down with rain the next! Sometimes I wish it would make up its mind. Hope it doesn’t drive you too crazy. A beautiful splash of colour – just what we need in this world of white! More grey here in London. I’m excited for some color! Lovely, spirit lifting photo! Spring is coming – it has to be!!! We are really enjoying seeing the flowers starting in South Carolina right now. There are a lot of azalea bushes in bloom, and they are gorgeous. I’m not looking forward to going home to snow, but I’m hoping that a lot of it will have melted by the time we arrive! Oh I’m sure all that snow has magically melted and there are flowers everywhere back home. You aren’t going home until June right? I love this pic! 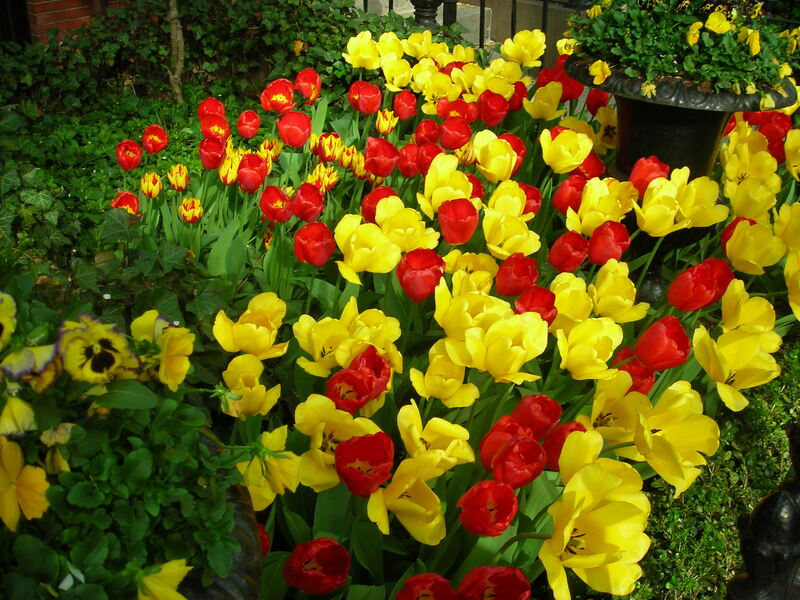 Tulips are my favorite flower. Such pretty colors. I love them as well. They shout spring! Uh oh – that’s the same weather we had last week right before we got another foot of snow! It’s almost all gone now as it’s warmed up so much. If it snowed a foot in London, the city would shut down. we need a “love” button. Those are beautiful! I love the bright bold colors.